A new box set that’s sure to haunt you with a shivery good time! Get ready to unleash 22 haunting Urban Fantasy and Paranormal Romance adventures with the Haunted by Magic omnibus! 24 New York Times, USA Today, and International bestselling authors have come together to create a can’t-be-missed line up of 22 novels packed with demons, shifters, vampires, mages, witches, fae, alchemists, and more! 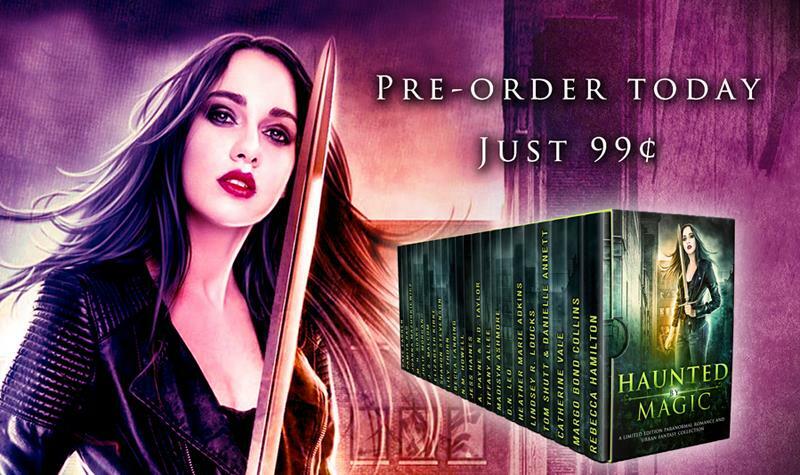 With over one million words of otherworldly fiction from the Urban Fantasy and Paranormal Romance genres, this boxed set collection will provide over one hundred hours of reading, including some BRAND NEW material! From rune magic to steampunk to Norse mythology and a whole lot in between, these paranormal and fantasy pages will draw you in with a whisper and startle you with flare. PreOrder Today to find out how these magical stories will haunt your dreams and keep you glued to your reading tablet well into the witching hour. Secure your Limited Edition copy with one click today! Pre-order today for only 99 cents! Posted on February 24, 2017, in Paranormal Romance and tagged alphas, anthology, box set, collection, fantasy romance, new romance, paranormal romance, PNR, PNR collection, romance box set, romance collection, UF. Bookmark the permalink. Leave a comment.